Students in a Sustainable City themed section of Laboratory--a required Foundation studio course that emphasizes systemic thinking and collaborative making--investigated the Union Square Park area for evidence of challenges in the realm of ‘sustainability’. Their mandate was to observe, research, and bring to light, through art and design practices, an issue of sustainability relevant to New York City. 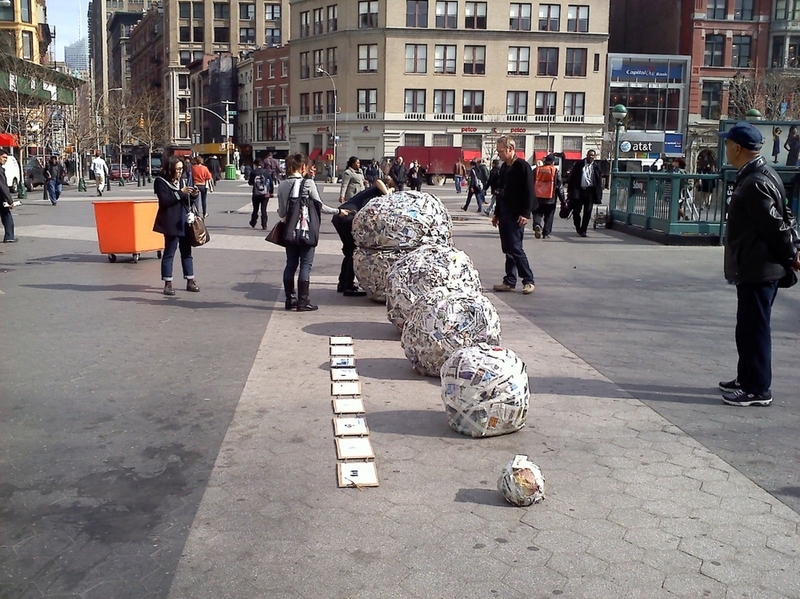 The project would culminate in a one-day installation in Union Square Park. Water, Transportation, Decomposition/ Decay, Waste. They then, in groups of 3, developed projects intended to educate, provoke, question, and magnify. The Metrocard Dress, an investigation into where the plastic cards come from, and where they end up. Small Matters, a meditation on menus and other tree-based handouts. Newspaper Tumbleweeds, a time-based study of the quantity of morning papers handed out in the Union Square Station in a matter of moments. Ecototes, a line of canvas bags emblazoned with a map of Union Square and the fauna that inhabit it. Earth Hour, a tribute to the annual global lights-out event that brings attention to climate change. ‘Endangered’ Species Flour Stencils, a recognition of the pollinators in New York City that might be endangered; stenciled in flour, they disappear over the course of a few hours. Forever, a fashion branding campaign that identifies materials in common use that cannot be recycled and will ‘never’ biodegrade, such as plastic bottle caps, and Styrofoam sheets. Gnomes, a cheeky messaging campaign that cajoles passers-by to recycle. E-Waste Tower, a sculpture of electronic parts that aims to bring attention to the hazardous components contained in our ubiquitous machines.